Have you ever wondered how to play shuffleboard? 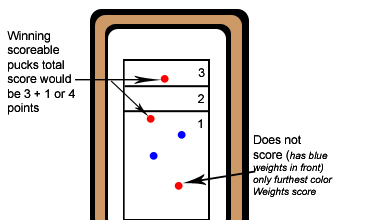 Here are the most common shuffleboard rules that generally apply to most games. The rules usually require that you alternately take turns sliding, by hand, all 4 of your weights against the ones from your opponent. Try to make it to the highest scoring area on the shuffleboard without falling off the end of the board into the alley. In order to earn points your weights need to be the farthest down the board. Some of the strategy and fun really comes into play when you knock off your opponents’ weights, outdistance them or use your weights to protect your other highest scoring weights.